When was the last time you checked your car’s tyre pressure? If you’re like most people you may not even remember! It’s something so easy to overlook or put off until “next week” but what you may not realise is just how badly this affects the life span of your tyres and fuel economy, not to mention handling and braking ability. You should also take into account how much extra weight you’re carrying, particularly on longer drives. 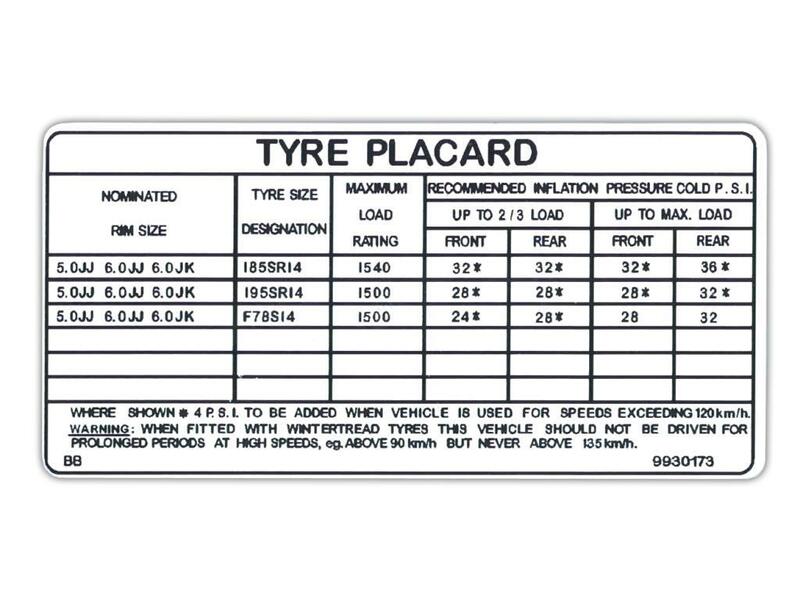 Since 1973, all cars must be fitted with a placard stating the optimal tyre pressure for that vehicle under various conditions. This is typically found either inside the driver’s door, glove box or fuel filler cap. It looks something like the example below. Driving on tyres with low pressure allows for a lot more flex in the sidewall. This means more body roll in the corners and an increased braking distance. It also distorts the shape of the tyre, allowing it to balloon out under the weight of the car. As the wheel rotates, this continue flexing motion of the contact surface and sidewall combined with added friction generates heat and reduces the tyre’s overall efficiency as we discussed in “6 Simple Tips to Save You Fuel ”. Combine all of these factors and you have tyres with a shorter lifespan, poor fuel economy and dangerous handling. All of this can be avoided by spending just a couple of minutes at the servo each month. Its time to stop procrastinating! While driving on under-inflated tyres is dangerous and costly, its also possible to over-inflate them which subjects you to a range of similar issues. Putting too much air in your tyres will cause the centre of the contact surface to push outward, raising the outer edges of your tyre off the road. While this reduces overall friction, it also reduces your tyre’s lifespan and grip. The difficult part is that each of these symptoms may also be caused by something unrelated like a poor wheel alignment or even the camber of the road. The only way to know for sure is to check them regularly. Inflating your car tyres isn’t as simple as attaching the air hose and waiting until the machine beeps (although this is better than not doing it at all!). To get the right pressure there are a few things you should keep in mind. Firstly, always check the pressure when your tyres are cold (cool weather and after less than 1km of driving) as a rise in temperature will also increase the air pressure. If there are no service stations nearby then check your tyres before you leave and make note of how far they are below the recommended pressure. When you do get to the service station, simply add this amount onto whatever their “hot” temperature is. Buy a quality pressure gauge to test with. It doesn’t have to be expensive but relying on the tired old pump at the servo is not going to give you an accurate reading. Make use of the newer pumps that allow you to set your intended pressure on the screen. They automatically stop at the right pressure and are typically far more accurate.